The used 2015 GMC Sierra 1500 in Bridgman, MI has aged like fine wine. This truck is only two years old! The 2015 GMC Sierra 1500 is loaded with AIR CLEANER, HIGH-CAPACITY, AIR CONDITIONING, DUAL-ZONE AUTOMATIC CLIMATE CONTROL, AUDIO SYSTEM, 8' DIAGONAL COLOR TOUCH SCREEN WITH INTELLILINK, AM/FM/SIRIUSXM, CONSOLE, FLOOR MOUNTED, RECONFIGURABLE, COOLING, AUXILIARY EXTERNAL TRANSMISSION OIL COOLER, CUSTOMER DIALOGUE NETWORK, DEFOGGER, REAR-WINDOW ELECTRIC, EMISSIONS, FEDERAL REQUIREMENTS, ENGINE, 5.3L ECOTEC3 V8 WITH ACTIVE FUEL MANAGEMENT, DIRECT INJECTION, FOG LAMPS, FRONT, HALOGEN, GVWR, 7200 LBS. (3266 KG), HILL DESCENT CONTROL, JET BLACK, CLOTH SEAT TRIM, LPO, ASSIST STEPS, CHROMED TUBULAR, 4' ROUND, POWER OUTLET, 110-VOLT AC, REAR AXLE, 3.42 RATIO, REMOTE VEHICLE STARTER SYSTEM, SEATING, HEATED DRIVER AND FRONT PASSENGER, SEATS, FRONT CLOTH BUCKET WITH (KA1) HEATED SEAT CUSHIONS AND SEAT BACKS., SLE PREFERRED EQUIPMENT GROUP, SLE VALUE PACKAGE, SOLID PAINT, SUMMIT WHITE, SUSPENSION PACKAGE, OFF-ROAD, THEFT-DETERRENT SYSTEM, UNAUTHORIZED ENTRY, TIRE, SPARE P265/70R17 ALL-SEASON, BLACKWALL, TIRES, P275/55R20 ALL-TERRAIN, BLACKWALL, TRAILERING EQUIPMENT, TRANSMISSION, 6-SPEED AUTOMATIC, ELECTRONICALLY CONTROLLED, UNDERBODY SHIELD, TRANSFER CASE PROTECTION, UNIVERSAL HOME REMOTE and WHEELS, 20' X 9' (50.8 CM X 22.9 CM) ULTRA BRIGHT MACHINED ALUMINUM. The 2015 GMC Sierra 1500 only has 33,114 miles on it and many more roads to travel. Its a v8 Summit White truck that can balance family and work. 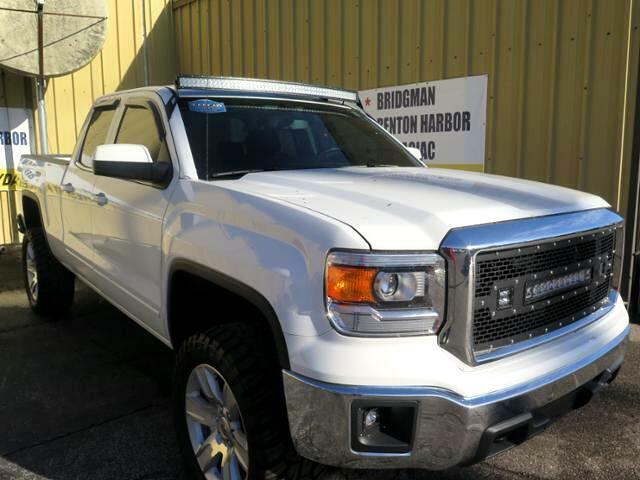 Want to learn more about this 2015 GMC Sierra 1500? Contact Dominion Chevrolet.